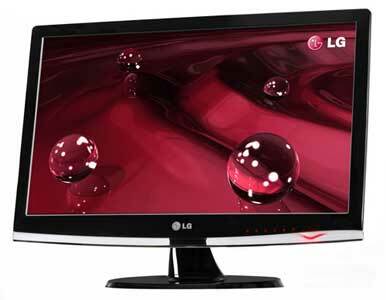 LG's 23-inch W2353V-PF, one of the company's Smart Series displays, differentiates itself from other monitors with its emphasis on reducing eyestrain. The display includes an AutoBright function and a sensor that can detect ambient light and adjust the screen brightness accordingly. Using the control worked fairly well, though in some circumstances (such as a room that was just somewhat dim) it was hard to see any discernible difference in the screen's brightness. The W2353V-PF performed well in our image quality tests, showing bright, realistic colors, particularly in our shot of a picnic. It also displayed text well, with sharp lettering, even at small font sizes. The monitor has a wide range of viewable angles: In looking at the screen from the side, the image did not discolor or distort. The W2353V-PF also handled our motion tests well, showing no visible blurring or flutter. The screen's touch-sensitive controls run along the lip of the bottom bezel. Rub your finger over the lip, and the controls appear on the screen. However, what some of them do may be obscure at first; they have labels like Smart, Fun, Menu, f-engine, Source, Auto/Set, and Power. The W2353V-PF includes both HDMI and DVI connections and a headphone jack on the back. The display can tilt, but doesn't swivel. The monitor itself has a nice look, with a smooth piano-black finish. All in all, the W2353V-PF would be a fine display for those who need a screen's brightness to be auto-adjustable. Its good image quality makes it well-rounded for both heavy text and graphics use.